Better Call Bill Warner Investigations Sarasota Fl: Photo of FBI Most Wanted Honor Killer 'Yaser Abdel Said' Surfaces on Facebook in Cairo Egypt. 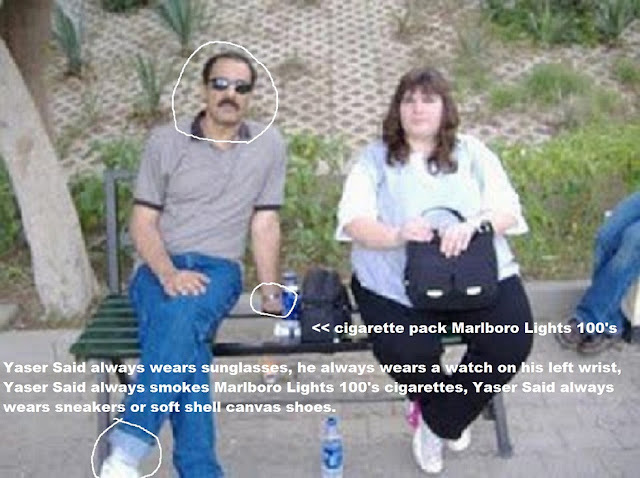 Photo of FBI Most Wanted Honor Killer 'Yaser Abdel Said' Surfaces on Facebook in Cairo Egypt. FBI Most Wanted honor Killer Yaser Said always wears sunglasses, he always wears a watch on his left wrist and he chain smokes Marlboro Lights 100’s and always wears soft shell sneakers. Photo of FBI Most Wanted Honor Killer ‘Yaser Abdel Said’ Surfaces on Facebook in Cairo Egypt, see photo above retrieved from the Facebook Page of Yaser Said’s nephew, Yousef, in Cairo Egypt. Yousef is the direct blood relative (nephew) of ‘Honor Killer’ Yaser Said, he is the young man in the middle with the American flag shirt. 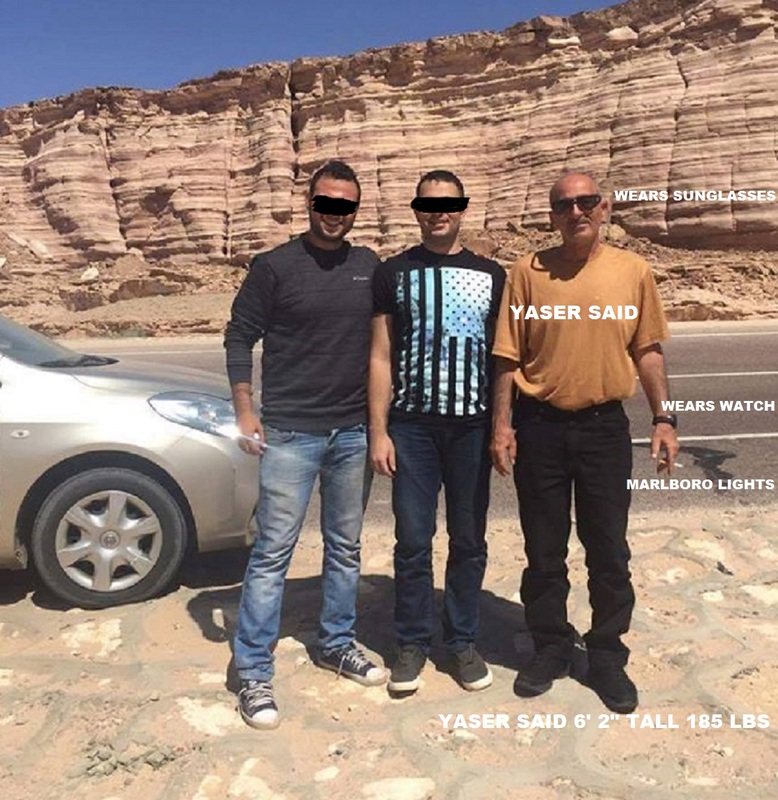 ‘Honor Killer’ Yaser Said is 6′ 2″ tall (74 inches), so are the other two men in the photo above. The car in the photo above appears to be a 2009 Nissan Altima 2dr silver coupe, they have a curb height of 55 inches, the three men in the photo are all 74 inches tall or taller. SOCIAL MEDIA JACKPOT: CNN Report, A recent survey found that Facebook is the most fruitful social network for law enforcement investigations. Due to the brilliant and diligent investigative work of a woman I will call ‘Sabrina’ it appears that she has located the once kidnapped nephew of Yaser Said, Yousef, in Cairo Egypt through his (and others) postings on Facebook. Sabrina contacted the Euless Police Department at 817-685-1526 in Texas. I followed up and called the Tampa FBI and spoke in length with a woman who took the full report. The sister of Honor Killer Yaser Said, Ghada Said, kidnapped her own children during a custody battle with her husband in Euless Texas and took them to Cairo Egypt in 1999. 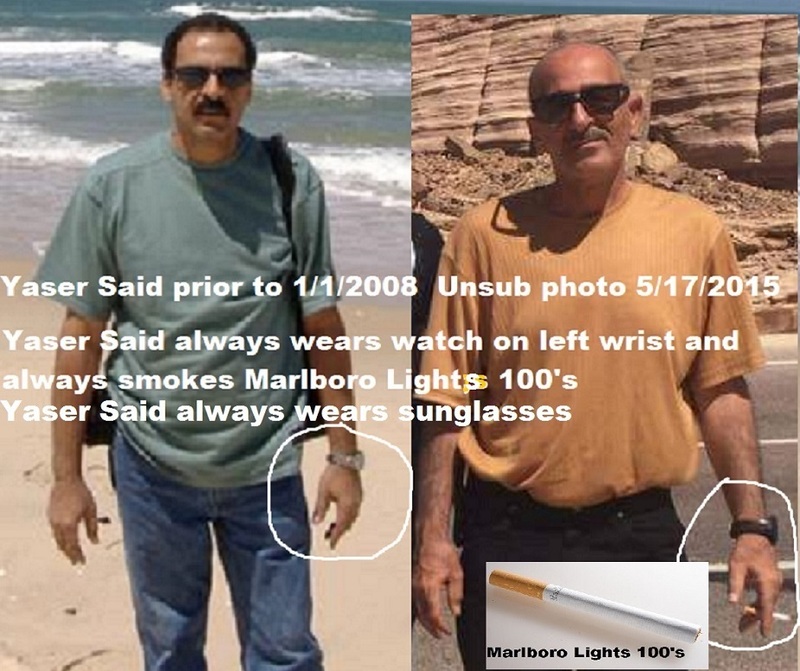 FBI Most Wanted Honor Killer Yaser Said is an Egyptian national, Yaser Said always wears sunglasses, he always wears a watch on his left wrist and he chain smokes Marlboro Lights 100's. 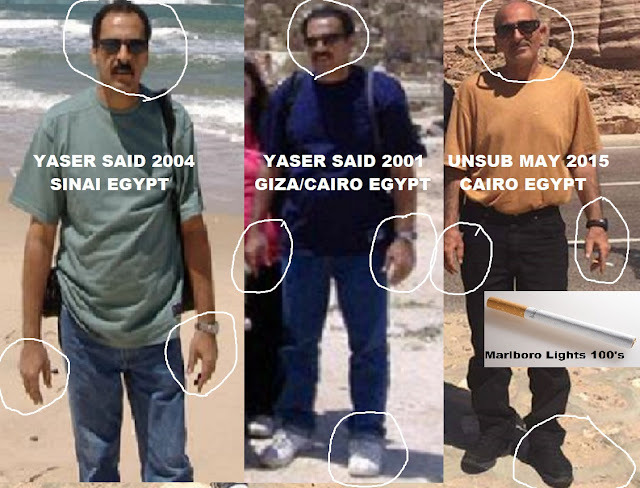 Yaser Said always wears sneakers or soft shell canvas shoes, he always stands the same way for photographs and hold his hands and arms the same way, see comparison photos above. The black shoes that the Unsub is wearing in the photo above appear to be Nike SB Portmore Canvas Skate Shoes, FBI Top Ten Most Wanted Yaser Said always wears sneakers or soft shell canvas shoes. Yaser Said told daughters Aminia, 18, and Sarah, 17, he was taking them to get something to eat before he shot and killed them on January 1st, 2008. On January 2nd, 2008, a warrant was issued for the arrest of Yaser Abdel Said, in Dallas County, Dallas, Texas, on charges of Capital Murder-Multiple. On August 21, 2008, a federal Unlawful Flight to Avoid Prosecution warrant was issued by the United States District Court, Northern District of Texas, Dallas, Texas. Uncovered cellphone records showed Yaser Said making multiple calls to family members (his brothers) immediately before and after his daughters’ deaths. Then he disappeared. 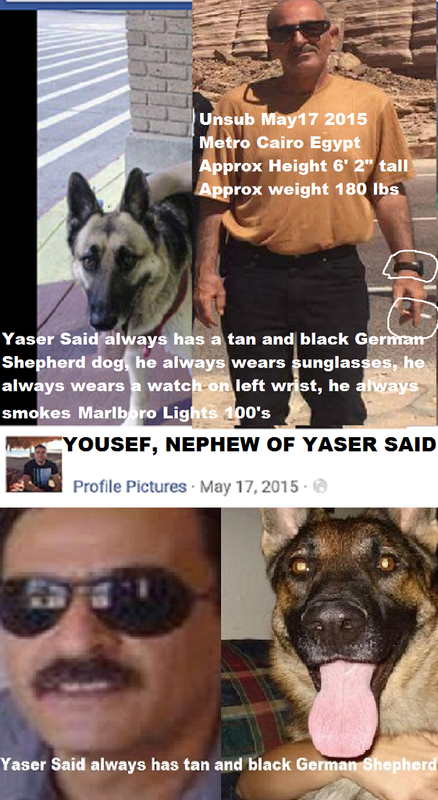 FBI Most Wanted Honor Killer Yaser Said loves dogs, especially tan- and black-colored German Shepherds, he always has a tan- and black-colored German Shepherd dog with him. Yaser Said is known to carry a weapon at all times. Labels: Photo of FBI Most Wanted Honor Killer 'Yaser Abdel Said' Surfaces on Facebook in Cairo Egypt.